There are more than 20,000 varieties of dahlias, including white, yellow, deep reds, and magenta-colored flowers. The rarer black dahlias are especially alluring to horticulturists. A new study explores the reason for its intriguing color. The scientists published their findings in the journal BMC Plant Biology. The Austrian research team collected 14 varieties of black dahlias, from Black Barbara, Arabian Night, Karma Choc, and Tisa, as well as five varieties with more subdued colors to analyze their petals. The scientists analyzed the activity of the enzymes that make pigments, investigated gene expression and measured the pigmentation. They conclude that the black color in these black dahlia varieties comes from high levels of anthocyanins. These pigments also give orange and red dahlias their colors, albeit at lower concentrations. Most black dahlias raise their anthocyanin levels by blocking an enzyme in the pathway that makes flavones, another molecule that has the same precursor as anthocyanins. 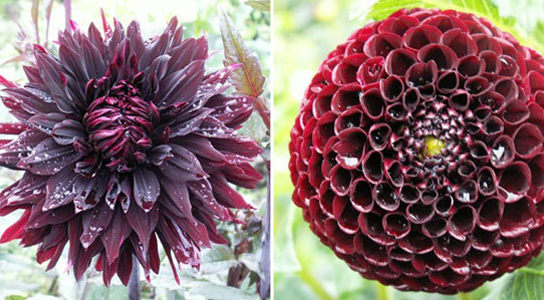 If the researchers figure out the cellular mechanics, they might be able to engineer dahlias with more black varieties. Be the first to comment on "High Levels of Anthocyanins Give Black Dahlias Their Color"